Ok, today is Thursday and that means the Disney Blog Hop! And that is the reason for my Christmas theme today. Today we are to post Disney pictures not taken in the parks. Well, every year my Christmas tree a Disney tree. It all started about 20 years ago when Ashley and I were living in Pensacola, Florida. We were far away from our family and living in a hotel and I still wanted it to feel like Christmas for her, she was only 4 years old. So we bought a huge Christmas tree and every payday we bought a few more Disney ornaments to go onto it. It was the hit of the hotel, it was all anyone could talk about-guests and other employees alike. We stayed there for two more Christmases and the tree went up each year and of course it was bigger and better each year. Well, I have added quite a few more ornaments over the past 20 years and I have passed down some of the original ornaments to Ashley to share with her family now. It is very sentimental to both of us. 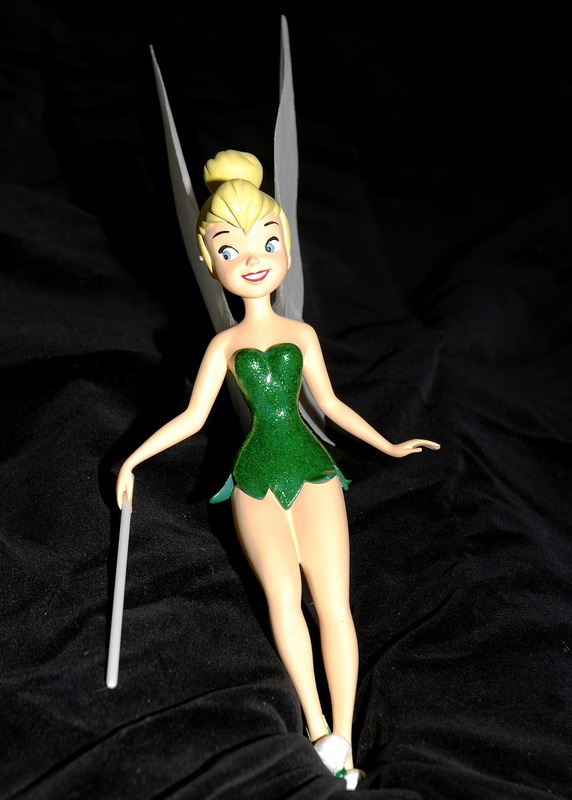 Here is a picture of Tinker Belle who sits on top of the tree each year now, there have been other bow toppers throughout the years but I love this Tink tree topper!! The song here is a medley of Christmas songs performed by Mickey, Minnie, Daisy, Donald and Goofy - I hope you enjoy it as much as I do!! Have a Merry Christmas - I mean Have a Magical Day!! What a great way to keep the magic alive for your little girl, even when life was hard! Thanks everyone, we have two trees at our house. One is my Disney tree and the other one is outdoorsy for my husband. I can't wait to get new ornaments on my vacation in July!! Beth we started out just mixing Disney ornaments with bright colored glass ornaments. Thanks Lucinda! You have a Very Disney Christmas too!